One (of many) differences between indie rock and punk is generally the sense of humor as it relates to self-awareness. Considering that other reviews namedrop Built to Spill frequently in the RIYL section for Pinned in Place, it’s a nice touch to start the record with the song “Built to Chill.” It’s both self-referential and a sweet name that describes the vibe of this record that, to me, has more of a punky Weezer thing going on than the powerful harmonies of Built to Spill. The music is definitely not the lean back on the couch kind of chill but, for something born in the punk scene, it’s more interested in song structure and interweaving unique sounds (and even a few time signatures in there) than its about venting aggression. Ghostwritten By is upbeat and faster than any Weezer record but the tempo is less relenting than most punk affiliated groups. This is immediately followed by a staccato opening to the next song, “Harshing It,” which blends to a melodic chorus with a shifty guitar bridge. Pinned in Place’s song structures are unsettled, the antithesis of their name. 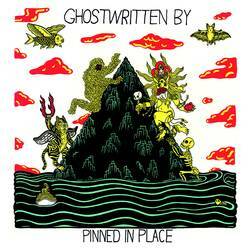 Ghostwritten By is a guitar-forward record with a lot of melodic flourishes that leap beyond the winding and jagged songs to give a dreamy but deeper vibe. “Confederate Sugar” has some of the most diverse elements that wander and build up to rock out, alternating back and forth between soft and tempered aggression, while the closing track “Ghostwrite the Whip” is one of the punkier jams with elements of a whacked-out Jawbreaker. While the complexity is up-front throughout the record and no song goes beyond three minutes. The band prefers a finicky minimal pathway in their songs as compared to a wall of sound approach, so don’t let the “mathy” descriptor suggest pretension. Among all the adjectives bandied about this review, it keeps returning to the DIY punk scene for aesthetics and approach. Posted Nov. 7, 2016, 6:12 p.m.
Posted Oct. 17, 2017, 11:36 a.m.